In The Golden Era of Major League Baseball: A Time of Transition and Integration, Bryan Soderholm-Difatte explores the noteworthy and significant changes taking place in baseball in and around the 1950s. Beginning with Jackie Robinson's rookie season in 1947, Soderholm-Difatte provides a careful and thorough examination of baseball's integration, including the state of blacks in the majors ten years into the Jackie Robinson era, when elite players were accepted but few blacks with "average" major league ability were regulars in the starting lineup. The author also looks at the dying practice of player-managers, the increasing use of relief pitchers and platooning, and the continued dominance of the New York Yankees. 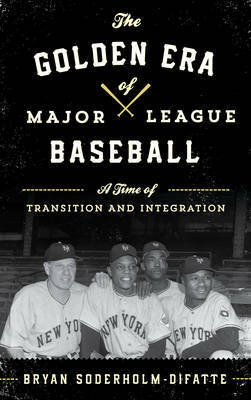 The Golden Era included three central characters whose innovations, strategies, and vision changed the game, and each of their stories is told in this book: Branch Rickey, who challenged the baseball establishment by integrating the Dodgers; Casey Stengel, whose 1949-1953 Yankees won five straight championships; and Leo Durocher, whose spy operations was a major factor in the Giants' 1951 pennant surge, but who was also a leading innovator in managing his pitching staff. Concluding with an overview of how baseball's race and diversity issues have evolved since the Golden Era, this book will be of interest to baseball fans and historians as well as scholars examining the history of integration in sports.